On a recent visit to the National Museum of the American Indian in Washington DC, I stood and gazed at the textiles and costumes hanging behind their panes of plexiglass, read the information cards attached to each piece and listened to the drum beats, chants and flute music that were being piped through the galleries. As stunning as they were, as beautifully as they had been displayed and as hard as the museum had tried to capture the context in which these weavings existed or still exist, it was difficult to connect these flat lifeless pieces to the moving, flowing three-dimensional fabrics that are part of the living breathing textile museum in which I live. I am talking about Bolivia, a country where an intricately patterned carrying cloth, slung from a woman’s shoulders, will suddenly wriggle and spring to life indicating that the baby nestled within has just awoken. A coca leaf bag here takes on an entirely different appearance when it is stuffed full of coca leaves and hung to swing from a man’s hip as he walks to market. The skirt of a festival dancer will move and swirl, each movement revealing another phrase of the woven story contained in its motifs. This story may be a collection of memories of her community’s past or a record of one of her own recent personal experiences. Some of these designs and motifs are so old that their original meaning has apparently been lost. Representations of such things as people, animals, paw prints, plants, farming tools, buildings and geographical features adorn these textiles. When I ask about their specific designs, weavers often explain to me that they are the motifs that their mothers and grandmothers had woven, chosen and arranged in the way they found most pleasing at the time. For them the motifs and their arrangement does not carry any particular symbolic significance. Another weaver, after a long pause, looked me in the eye and simply said “This is what we weave” a statement which seemed to carry as much depth and pride as if she had said “This is who I am”. I am sure that in a lot of cases the language contained in a weaver’s cloth is so deeply personal and sacred to her community that it cannot be shared with an outsider such as me. 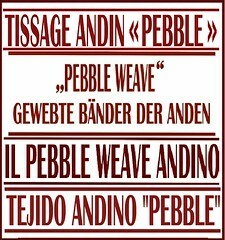 I am also convinced that the concepts they convey may only be possible to describe effectively in the weaver’s native language in words that simply cannot be translated into Spanish. 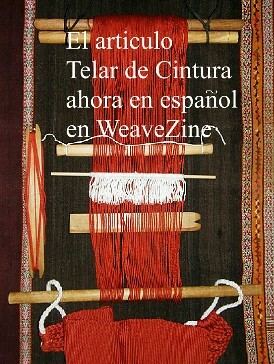 According to Roberto Milán Bueno in Diseño Textil Nativo Boliviano the Spanish conquerors, suspecting that the woven designs contained hidden messages that could be transmitted between communities, forced the indigenous people to adopt the Spanish style of dress so that the woven vocabulary would be forgotten. 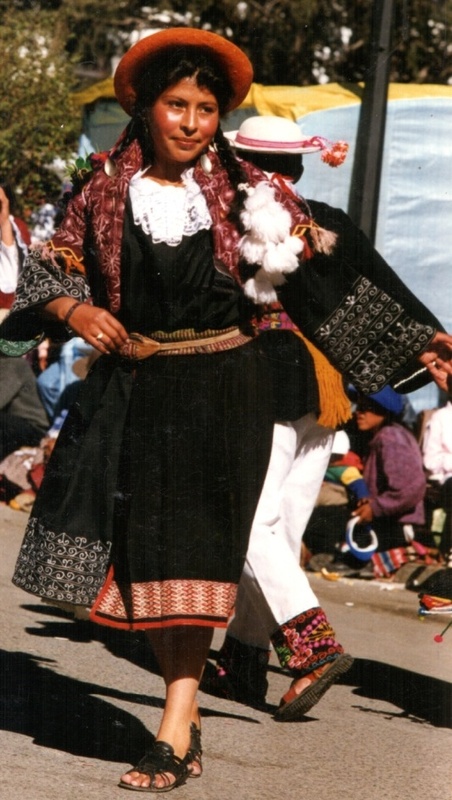 Fortunately, many of the pre conquest designs and motifs endured, Spanish influences have also been incorporated and today, amongst the indigenous people of Bolivia, nothing identifies more clearly a person’s community or ethnic group than the technique, spacing, colors and designs used to construct the hand woven textiles that they wear and carry. Within these communities, the possession of textiles is a symbol of status. Those who own the finest or largest quantity of textiles show that they have more resources such as, animals that provide the raw materials, time to spend at the loom as well as cash for purchasing the acrylic yarns that are used to make the garments worn specifically for religious festivals and community celebrations. 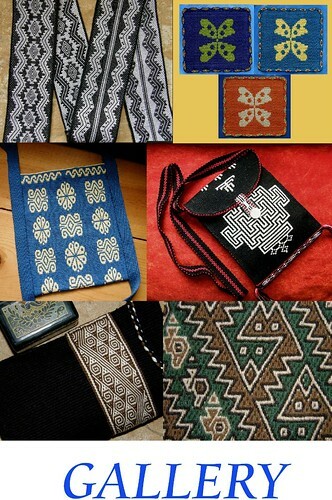 The use and significance of the textiles varies from region to region. In some communities the type of head covering used by a woman will indicate her marital status or her availability for courtship. 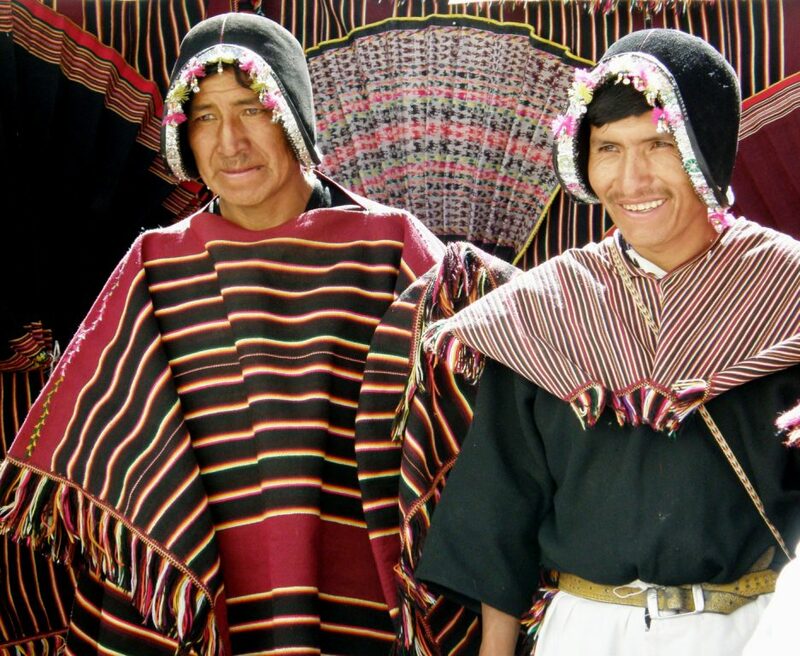 In others, traditional authorities, elderly and married men are required to wear a poncho in order to be perceived with the dignity and prestige that they deserve. Those who do not, or cannot, will not be respected and their wives will be denounced as lazy women who are incapable of taking care of their husbands. Communities in the Potosi region weave cloths woven in red yarn which they call llallawa mamalas meaning “mother of the food” with which they cover their harvested potatoes and grains believing that this will insure their food supply lasts until the next harvest. Specially woven textiles are hung over the roof trusses of newly built houses to watch over and bring good luck to their occupants. While the people in the isolated country communities struggle to cling to these beliefs and practices, a community member heading to the big city will take off his treasured poncho, woolen hat and coca leaf bag lest he be ridiculed there. Instead of the poncho he will more likely have his wife’s carrying cloth draped over his shoulder which poor economic conditions are forcing him to sell in the city. Unless it is of the finest quality, the cloth will be cut into small pieces, made into wallets and sold to tourists, and people will go to museums to gaze at beautiful cloth and wonder at the meaning contained within. Women in the Potosi region of highland Bolivia often use only two sheds on their backstrap or ground looms to weave colorful bands in warp faced double weave which they use as belts. The technique gives the weavers the ability to create clean crisp designs on backgrounds of solid color with the colors reversed on the two layers. 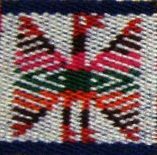 On most of the belts that I have encountered the weaver has chosen to create a background of stripes using five to six bright colors on which she has placed a variety of animal and geometric figures woven in white. The reverse, therefore, shows colorful figures springing forth from a white backdrop. I always joke that the only problem with double weave is deciding which face you prefer. However, many Potosino weavers deal with this dilemma by weaving alternating blocks in which they reverse the colors allowing them to display both design possibilities at once as they wear their belts. The weavers in the highlands are renowned for the sturdiness of their beat as they weave. This feature combined with the double weave structure creates a thick and extremely firm textile which is woven just long enough to encircle the wearer’s waist once. So appreciated and admired are these strong intricately patterned belts that on my last visit to Ecuador I noticed that some women in Otavalo, who are themselves accomplished weavers, are choosing to use them in place of their supplementary warp patterned belts. One very common design feature in these belts is the small flower motif. I hasten to add, however, that you could ask five weavers about this motif and receive three different answers about what exactly it represents. I have been told that it is the sun. Another weaver told me that she sees the motifs as coins and that the more she weaves into her belt, the more money she is likely to attract. In any case, this little symbol appears in many places along the belts, sometimes on the end of a stalk looking very flower-like, but other times hanging quite unexpectedly from a condor’s wings or perched comically on the tip of a viscacha’s tail. My weaving teacher in Potosi, a very practical woman, not given to discussing our need to apply romantic interpretations to the figures on her weavings, or perhaps just not willing to share their significance with me, told me that these motifs are basically used to fill spaces. Her explanation makes perfect sense from a structural point of view. 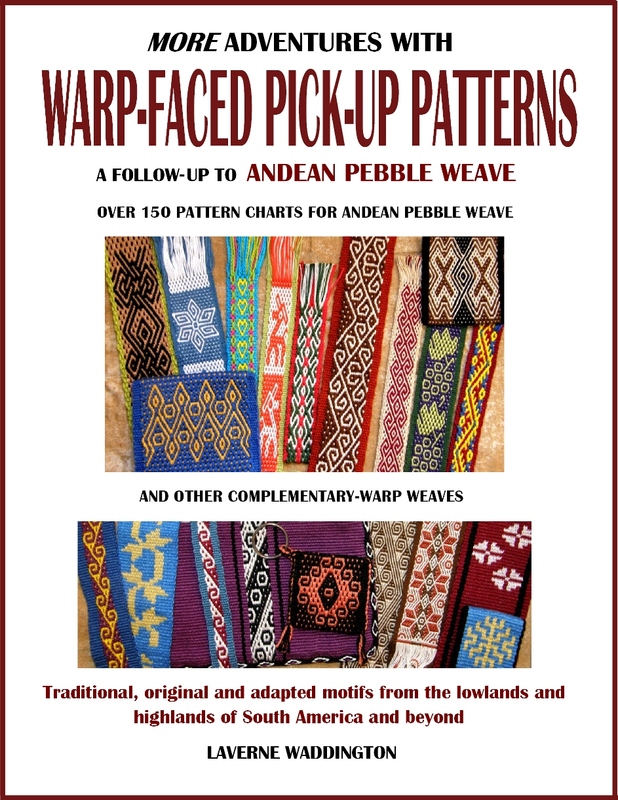 The two layers of these warp faced double weave textiles are held together at their edges as the single weft passes from upper layer to lower and vice versa. If a band of solid color is woven without motifs, the result would essentially be a hollow tube. 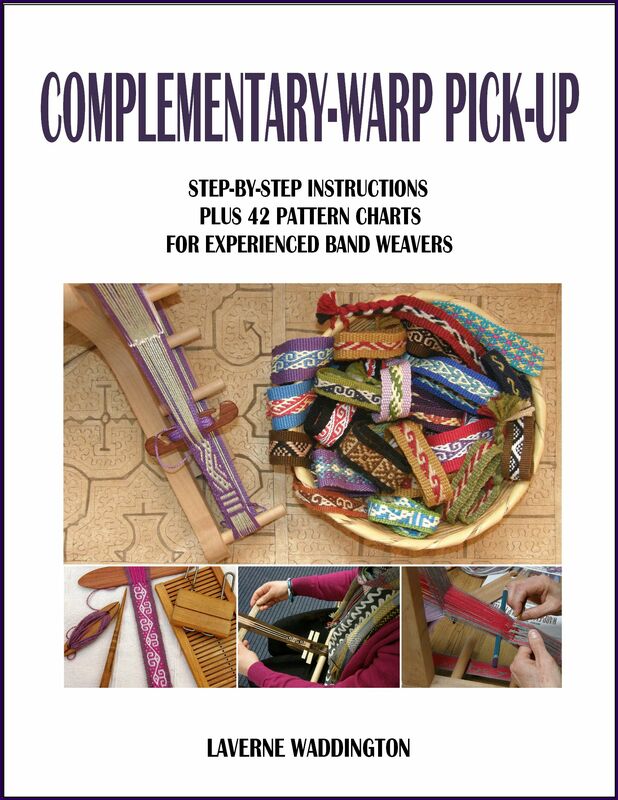 It is only when motifs are woven into a solid background that the faces of the tube are bonded by the interchange of warps between the upper and lower layers. It is, therefore, desirable to fill as much negative space as possible. 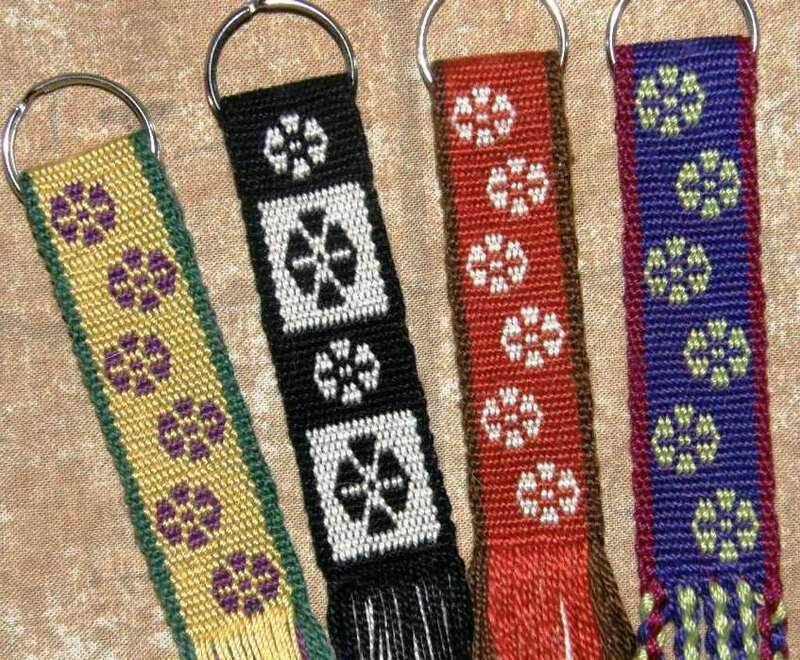 Whether you see them as mere “space fillers”, coins, suns, or flowers these pretty Andean symbols and the colorful double weave belts which they adorn are the envy of weavers in many other parts of Bolivia where the technique is unknown. I can’t wait to dig into the double weave! It is really too bad that they only used part of this article. 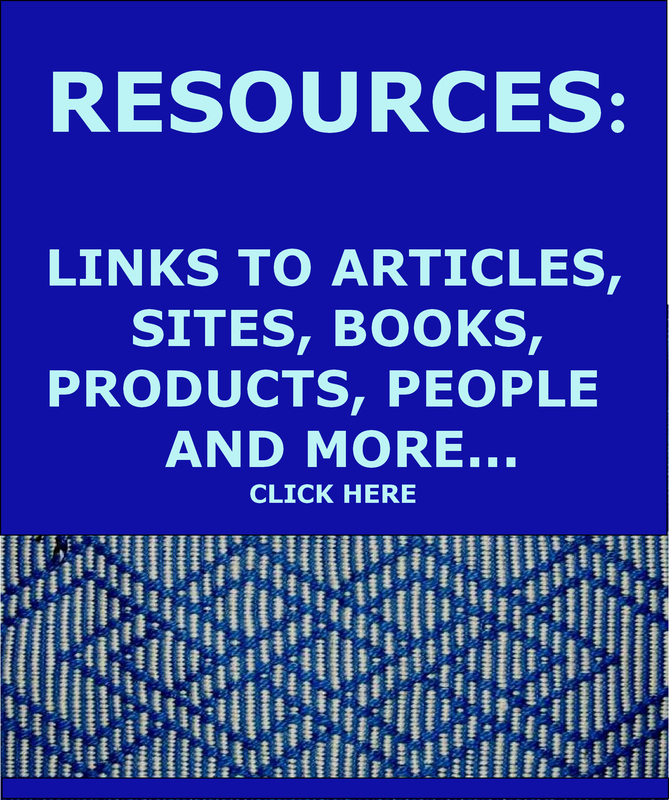 It is very well written and informative, much as your blog is! Glad to see you made it home safe and I am looking forward to these postings as usual. I always enjoy your writing, you manage to impart an incredible amount of information that also conveys the love that is behind the story and a part of the legacy of hand weaving.